All 32 voting members of the Board of Governors (BOG) of the University of North Carolina system are political appointees, with 16 appointed by the Republican-dominated NC Senate and 16, by the Republican-dominated NC House. Just before the "review process" was launched by the BOG which climaxed yesterday with the unanimous vote to close three progressive centers of study at three member institutions, both the Pope Foundation and the Civitas Institute had called for the review of centers of study as a cost-cutting measure. Actions by the Republican-dominated General Assembly, and their handmaiden Gov. McCrory, have sparked the Moral Monday movement as opposition to extremism in government has spread wide in the state. 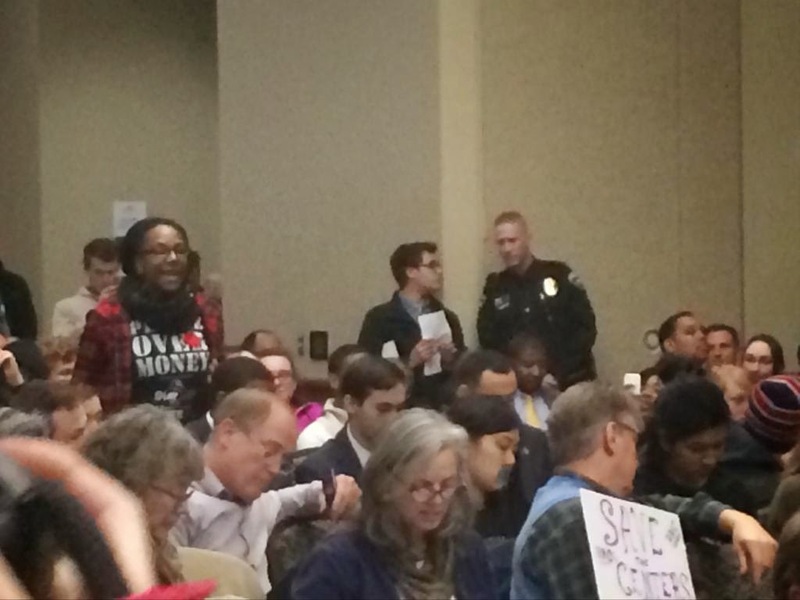 And now the actions of the political tools on the BOG appears to be sparking a backlash among students (and faculty) that could become an even bigger comeuppance for the overlords. Yesterday at the BOG meeting in Charlotte, protesting students temporarily shut it down, forcing the Board to abandon the room and violate the spirit at least (if not the letter -- see below) of the Open Meetings Law by moving to a smaller room and barring the public. The ejected students stood outside and chanted. Students now interrupting meeting, reading statement about university system ideals. Now Fennebresque calling on police/security to take students out of room. One person escorted out. Students singing "what side are you on? You're on the freedom side!" Students seem to be invigorated by recess of #UNCBOG meetings. "Show me what democracy looks like. This is what democracy looks like!" No official statement yet, but the entire #UNC Board of Gov. has left room. Here's the Update. 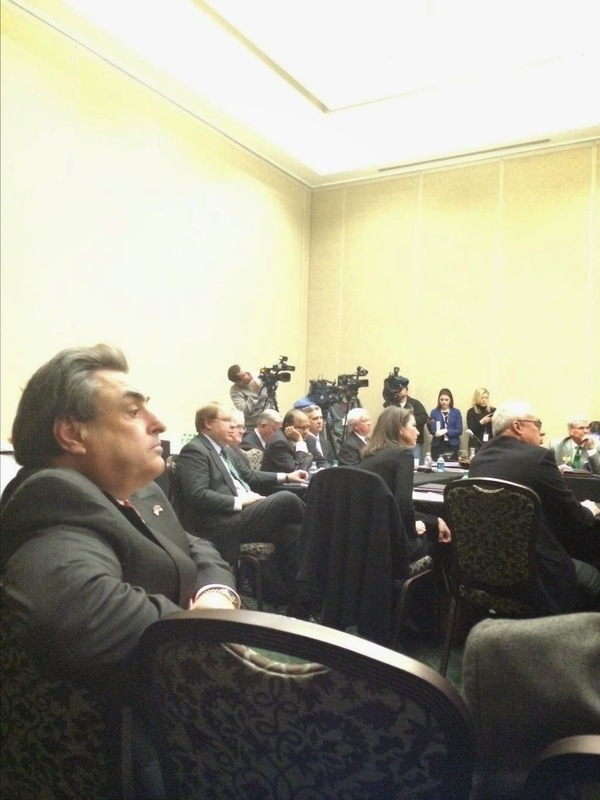 Board of Governors moved to a smaller room. Keeping most members of the public out, press (including me) allowed in. Students shouting outside "If we don't get in, Shut it down" Hard to continue meeting. apparently audio and video may not be working in other room. Everything on hold. Students still shouting/chanting outside. 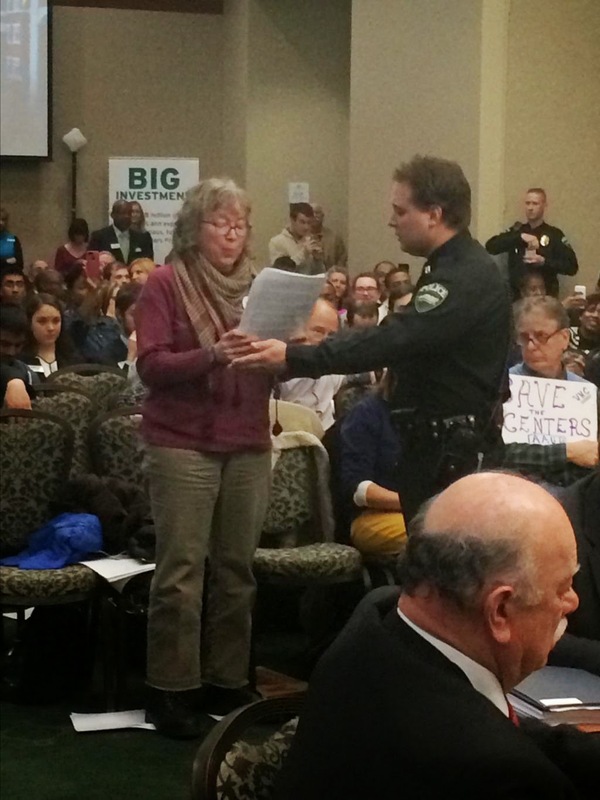 UNC-Charlotte Chancellor Dubois: tells BOG, "My position is that we don't want to remove the students. It'll be far worse." Vote is now on whether to accept report on centers/institute. Passes unanimously. The transparent political calculation in closing the UNC Poverty Center, whose director Gene Nichol has been outspoken in criticism of the BOG members' political patrons in the General Assembly, is visible from outer space. ...after careful review of the Center on Poverty – which included an opportunity for the center director to fully describe its work – the board concluded the center was unable to demonstrate any appreciable impact on the issue of poverty. We also felt the center did not enhance the educational mission of the university, did not work across disciplines to effect change and did not have the financial support to sustain it – the same criteria used to evaluate all 240 centers. I think that the BOG is perhaps better when it keeps its mouth shut. Really, Mr. Fennebresque? Out of 240 centers, it just randomly happened that one of the three the "objective review" found it necessary to close was the one that is bringing perhaps the MOST public attention of any center in the entire system to the problem that it was set up to address? Which just happens to be a problem that is getting worse b/c of policy decisions of the current party, which, it just happens, this Center's director liked on a regular basis to point out? And, upon which it is presently very difficult to have any "appreciable impact" because of decisions by the current GOP leadership not to expand Medicaid and that sort of thing? Whatever we are out here in the public, we are not fools. Some of us did graduate from the university at stake here and learned some critical thinking skills, and this "reasoning" just will not fly. "Will not fly"? 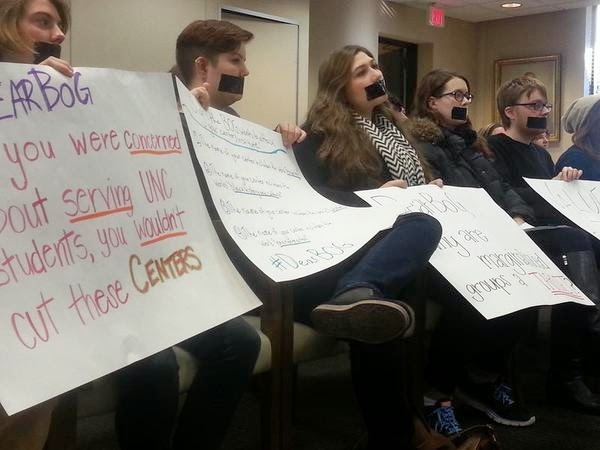 We look forward to students and faculty across the UNC system standing up against this political crap. The next meeting of the BOG may be even "hotter." All students were barred from entering the new meeting room, a move which Amanda Martin, general counsel to the N.C. Press Association, said was likely not in accordance with North Carolina’s Open Meeting Law, despite the fact that the board streamed the rest of the meeting on projection screens in the original room. What you didn't say -- and shame on you for forgetting! -- is that the BOG already had the blood of President Tom Ross on their hands ... fired for no good reason other than he's a Democrat. We're now living on a scorched earth, brought to us by "free market" ideologues. God help us. All you have to do is talk with our local Republican leaders to understand why they don't place any value on education.